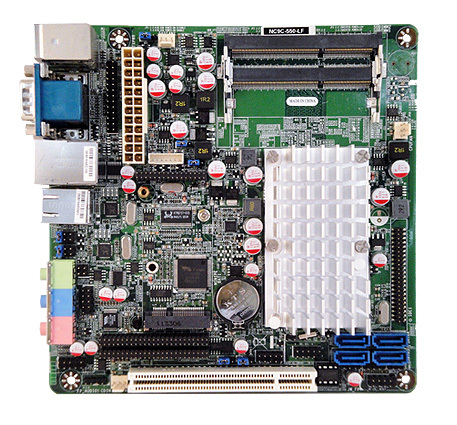 NC9C Series :: NC9C-550-LF / 475-LF / 455-LF :: Intel NM10 Chipset :: Atom Dual Core N550, Single Core N475 / 455 (Pineview-M) :: Mini-ITX Motherboard :: JETWAY COMPUTER CORP. Description Fix CPU temperature and throttling issue. 1. Supports PCIE Wake-on-LAN function after AC power loss. 1. Fix COM mouse issue in OS. 1. Fix OVP 12V function error. 2. Remove PS2 KB/MS swap function. 2. Support PS2 KB/MS swap function. Support New IO chip F71826AD. 1. Fix LVDS 1280x768 panel issue. 2. Add RS485 option for AD4COM daughter board. 1. Fix LVDS 1280x1024 & 1366x768 panel issues. 2. Fix PS2 KB wakeup cannot be disabled when PS2 power-on jumper is enabled. 3. Fix cannot detect mouse issue when S3 resume with a 4-COM daughter card.